Indian Air Force Notification is out. Indian Air Force is recruiting for 100+(Not Specified) Group Y (Non-Technical) Govt Job Posts. You can check Indian Air Force - Indian Air Force last date, download Indian Air Force notification, visit Indian Air Force official website and check other Indian Air Force Vacancy details.Complete Vacancy and recruitment Details about 100+(Not Specified) Group Y (Non-Technical) Govt Job vacancies in Indian Air Force are provided below by JobSarkari.Com only for you. Last Date for IAF Rally 09/12/2018. Candidate Must Have Passed Class 12th With 50% Marks in Aggregate and 50% marks in English. 1.6 Km run – within 5 minutes 40 second. Chin up – minimum 08. Push-up (plank type) – minimum 20. Bent Knee Sit Ups – minimum 20. 2.Candidate Need to Reach the Rally Venue Along With Required Documents(As Mention in Notification) on the Date and Time Given Below. Chamundi Vihar Stadium, Nazarbad, Mysuru , Karnataka up to10 AM on 05 December 2018 and 07 December 2018. Q. 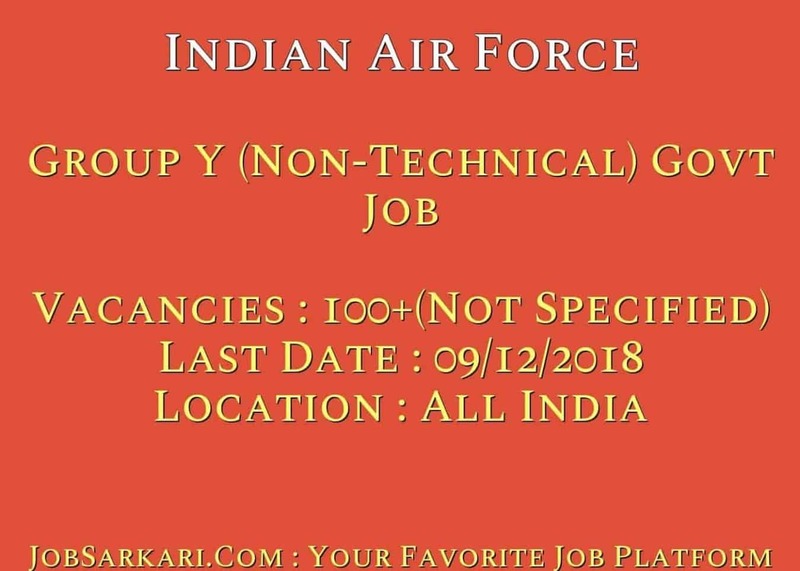 What is the Last Date For Indian Air Force Group Y (Non-Technical) Govt Job Vacancy ? A. 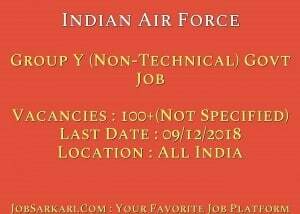 Last Date for Indian Air Force Group Y (Non-Technical) Govt Job Posts is 09/12/2018. Q. What is the Form Type of Indian Air Force Group Y (Non-Technical) Govt Job Recruitment ? A. The Form Type for Indian Air Force Group Y (Non-Technical) Govt Job Posts is Offline. Q. How many vacancies are available in Indian Air Force Group Y (Non-Technical) Govt Job Posts ? A. There are about 0 Vacancies in Indian Air Force Group Y (Non-Technical) Govt Job Posts. Q. What is the Full Form of Indian Air Force ? A. Full Form of Indian Air Force is Indian Air Force . They have any age relaxation in this post. No, There is no Age Relaxation. is job ka online from kab se open ho ga…. I am a candidate of Assam.Can I apply?